thanks for the info,picked up my mkv last week and am awaiting my cable now,have been intrigued how the head unit came out.found your blog useful. 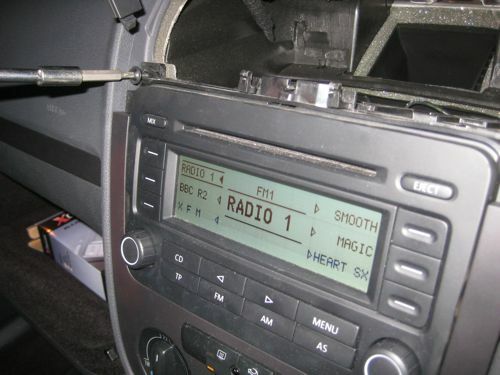 Found this very useful, I want to get my cd working and found there is an ipod socket in the glovebox...so assume the changer was disconnected when the ipod lead was put in. Great little guide. Will same me lots of time trying to figure it out. Thanks. 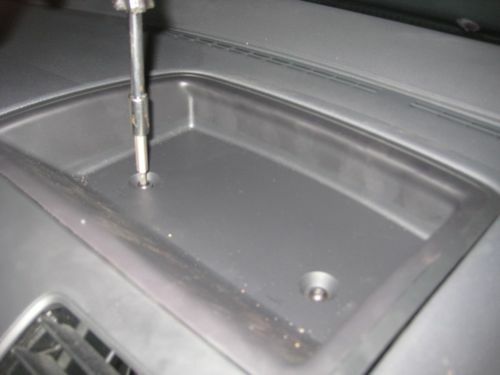 'rubber anti-slip mat or tray on the top of the dashboard and there are not two screws which have Torx screw heads. I've just spent 45 mins trying to get top of instrument panel away from dash and don't want to force it. Can't believe we are all spending hours of this rather than just plugging in pods. This is supposed to be the 21C! What are VAG group doing bu not having ipod access?!!! Just to add I finally was able to remove the up and bottom part of dash, head unit, cg lighter and everything you need to. VW cert don't make it easy! Fitted a Connect2 ipod link cable (£33) to cd changer socket. Didn't work at first, so I fiddled to ensure a tighter connection and it worked fine, ipod sounded great, no track access but sound quality good. Then connection failed. Very frustrating. 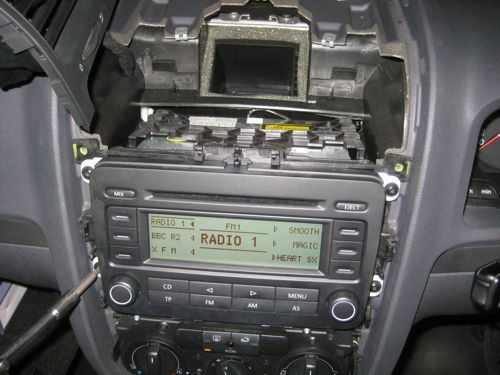 Attempted many times to improve connection by removing and re fitting cable to socket but it now completely fails to recognise ipod in CD changer mode. I reckon Connect2 cable (made in Uk...) is inferior prduct, feels very plastiky, I wd avoid. So a waste of a bank hol monday but still, will try again with another product. That's very frustrating - I've had plenty of those sorts of experiences too. Would recommend the XCarLink hardware. Give that a go. Bit more pricey, but solid and reliable. Very handy - I was trying to figure out if I would need any special tools for this, obviously not! You don't have experience at fitting a bluetooth hands free kit I suppose? Just trying to make sure now that I have the correct adaptor cable for the RCD300 radio. I have the VW iPod interface already fitted from new. 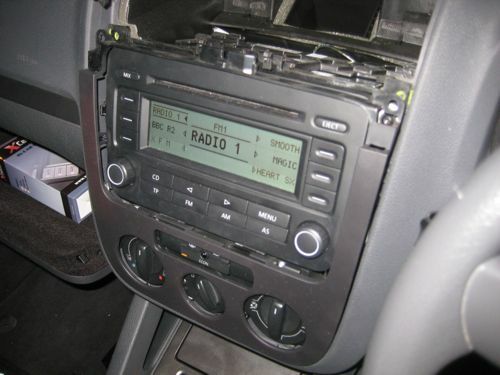 how can i put the radio code in my vw golf radio mk5,has i had to remove the battery to remove the gearbox.help,i have the code but cant work it out how to put the radio code in. I got the connects2 Delta 6 Double Din, will this connect to the back of my headunit? I've got a MK5 golf 2007 1.6fsi. Thanks Jonathan, this was of a huge assistance! is it possible to get an auxilery port put into my mk5 golf? telephone buttone on steering wheel but dont know if i can get anything to make it work. Great info, I found this really useful. Works a charm for me (I have a very similar setup). I found plastic cycle tyre levers really useful for removing the trim without damaging it, I used "Halfords Glass Fibre Reinforced Bike Tyre Levers". what a full and informative guide it meant I could fit my connects 2 mp3 adapter in less than 20 minutes with no hassle! Wife now very impressed with sounds in her Golf. Disc wont eject.Whats da problem and what can be done to sort it. I have same problem. Everything else in stereo unit, including radio and even the disc that has been stuck in CD player for 5 months or so, works. Is there any way of sorting or is a new unit required? You are right about the top plastic tray, it does require some pulling. Great site. Top stuff! Thanks for the useful info!! Just fitted that Xcar kit into my brother's VW Golf for him, and it was very easy, took me about 35 mins start to finish!! Thanks for posting Jonathan. Excellent instructions. Only thing I would add is leave air bag sensor connected to top panel as you may need to have this reset by dealer aka Passat. hi i have just purchased a golf mk5 and the is only sound coming from the passenger door speaker. Ive tried the balance but still only coming from the one speaker, any suggestions? Thanks for the guide Jonathan - it was really useful fitting my XCarLink yesterday. 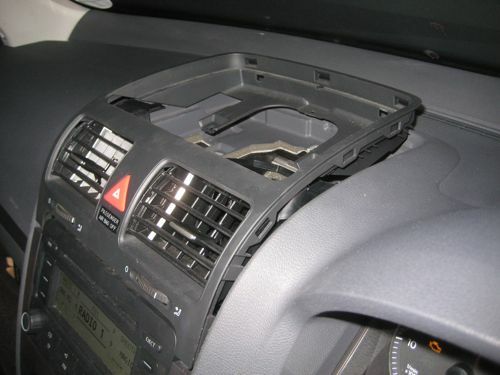 One word of warning for others - don't disconnect the passenger airbag light from the section containing the vent grilles and then turn on the ignition (as I did). 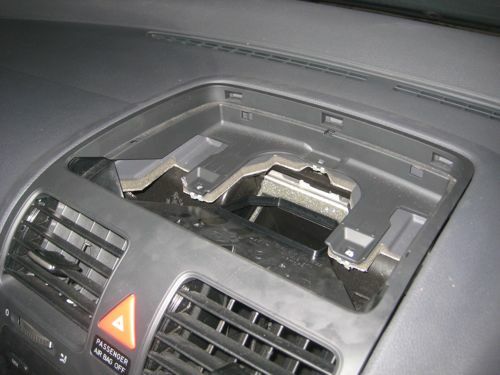 This will leave you with an airbag fault light which you need a diagnostic tool to reset. Safest to disconnect the battery for the duration of the process. I´m thinking of buying an xcarlink for my RCD300, but i have a doubt, wich connector ??? I believe it's mini ISO that you need. If in doubt, speak to the Xcarlink people. They are very knowledgeable. id need some help my fm is very noisy too much interference ,how do i fix it or ehat do i look for ????????????????anyone ? what is model number blue tooth kit for 2007 vw golf rcd 300 stero?